The Mars Society Germany plans with its project ARCHIMEDES (Aerial Robot Carrying High resolution Imaging, Magnetometer Experiment and Direct Environmental Sensors) to send a probe to Mars, which shall deploy and inflate a balloon in space. The balloon will be the carrier and entry vehicle of a probe with instruments to take measurements in the high atmosphere of Mars. Besides the Mars Society Germany e.V. the project is supported by the University of the German Armed Forces in Munich, the AMSAT-DL e.V., the DLR and several research institutes and companies. It is planned to integrate the probe into the P5-A Mars satellite of the AMSAT and then to deploy the spacecraft in Mars orbit. Because this project is a relatively complicated thing and such an experiment with a balloon has never been done before, of course some preliminary tests are necessary. Amongst others a parabolic flight to test the balloon deployment mechanism in microgravity and a space test on board the Rexus 3 sounding rocket were conducted. Not long after the latter test I joined the balloon building team and took part in manufacturing, testing and integration of the balloon. During the time from end of 2006 to October 2008 concepts for the manufacturing of a reentry balloon made from segments of a foil were worked out, material tests were conducted and the balloon was manufactured and tested. This balloon cannot yet fully withstand the rigours of a Mars atmospheric entry, but is an important step towards a balloon being capable of doing this. 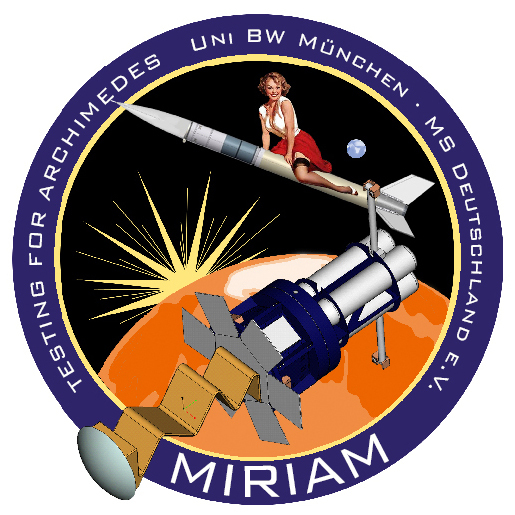 At the same time the spacecraft MIRIAM was produced, which, riding on top of Rexus 4, was to carry the balloon into space and then deploy it. After numerous tests to ensure the space proofness of MIRIAM, the balloon could be integrated. First inflation test of the balloon. The balloon has a diameter of 4 m.
Folding of the balloon. This is necessary to store the balloon in the spacecraft. Here the balloon is folded and vacuum packed until integration into the spacecraft, to prevent the fold from opening. This is necessary because the balloon material is relatively stiff.